JUNK SHOT App has been wowing customers for years. And the latest advancements are no exception. A new user interface, and quick login with your Google or Facebook accounts, are just a few of the upgrades the New JUNK SHOT App is offering customers. JUNK SHOT App invented visual-quote Junk Removal. So it’s only right we continue to lead the junk removal industry with world class service and convenience. On top of the value of our Bigger Trucks, Better Pricing promise, JUNK SHOT App now offers continued savings with our New VIP Rewards Program. Users can now earn points for their completed, JUNK SHOT, junk removal services. Points are good for Discounts and Free Junk Removal for our VIP Rewards Members. The good news is, is that every JUNK SHOT App user is automatically enrolled in the VIP Rewards Program. So, do yourself a favor, and download or update the JUNK SHOT App on your phone. 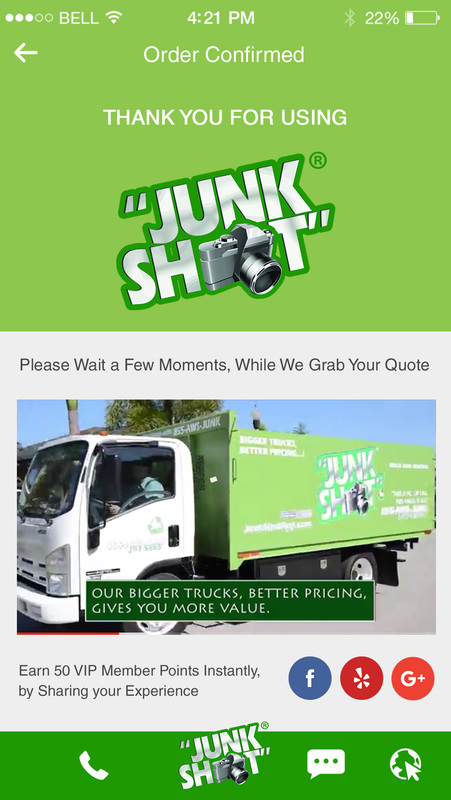 Discover all the new JUNK SHOT App features that make junk removal even easier. In addition to saving you time and money, JUNK SHOT App looks to keep you up to date on advances in junk recycling and cost-saving promotions for your home and business.